Bhopal : Three persons were killed and two others injured as violence broke out during an ongoing farmers’ agitation in Mandsaur district of Madhya Pradesh, prompting the authorities to clamp curfew in the trouble-hit area. Some eyewitnesses alleged that the victims suffered bullet wounds but district authorities denied that there was any firing by police on the protesters, who went on a rampage. A magisterial inquiry has been ordered into the deaths, Mandsaur Collector S K Singh told PTI, adding that police categorically told him that they didn’t fire at the protesters. The deceased were identified as Kanhaiyalal Patidar, Bablu Patidar and Prem Singh Patidar, Curfew has been imposed in Pipalya Mandi police station area of the district where the incident took place, while prohibitory orders restricting movement under section 144 of CrPC have been imposed in rest of the district. “Police have told me that neither did they fire nor did they have any orders to fire,” Singh added. Farmers in western Madhya Pradesh are protesting since June 1, demanding higher minimum support prices among other things. According to eyewitnesses, protesting farmers torched vehicles and indulged in stone pelting in Parshvanath area under Pipaliya Mandi police station limits. Meanwhile, the Leader of Opposition in the Assembly, Ajay Singh, demanded the resignation of Chief Minister Shivraj Singh Chouhan, it is a shameful incident for a chief minister who claims to be a farmer’s son. “All the claims of the chief minister have proved false so far. Now the government is using bullets to suppress farmers’ voice. Chouhan should resign immediately,” the Congress leader said. The main opposition pary also constituted a committee of MLAs to investigate the Mandsaur firing incident. Singh and state Congress chief Arun Yadav would visit Mandsaur tomorrow. Senior Congress leader and MP Jyotiraditya Scindia also condemned the incident. 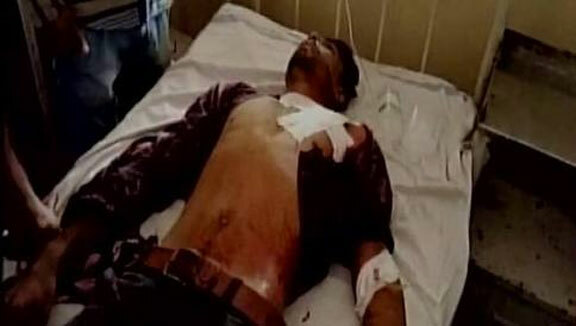 The BJP government dealt with the agitation through bullets instead of talks, he said. “This is a black day in the history of state. It is shameful that the state government is crushing farmers’ agitation. Farmers’ demands are genuine,” Scindia added. Trouble was reported from many parts of western Madhya Pradesh as farmers’ stir continued for the sixth day today. In Indore, police used lathi charge following stone- pelting during a march by farmers. A police officer said that people taking part in the march started throwing stones at the police near Devi Ahilyabai Fruits and Vegetable Market, which led to lathicharge. Bhagvad Gita in Madhya Pradesh school syllabus?